Hi everyone. 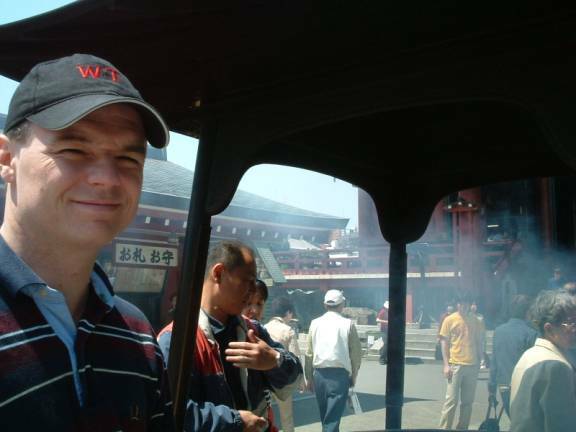 The following are a few pictures from a trip I took to Tokyo. The pictures are a little large in size if you have a 56k connection (a 56k connection usually means you have to dial a phone number to connect to the internet) and will take a while to load. They will load quickly on a high speed connection You can download the pictures by placing your mouse on the picture and pressing the right mouse button (the button you do not usually press for left hand mouse users) and then clicking on save. When I get up in the middle of the night and I walk through my doorway one of two possible hazards face me. Either I trip over the raised ledge in the doorway or I step up on the ledge and as a result my head bashes into the top of the doorway as I usually have about 3 mm clearance. This is not a problem as long as you remember the pain of the last accident but I still fall victim to these hazards if I am hurried or I just woke up. This is my last warning. PS: there are no such ledges in just enough doorways for you to believe you do not have to pay attention as you are walking through doorways. 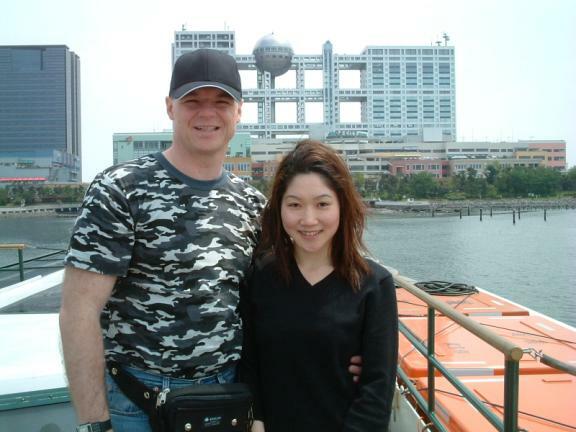 This is my girlfriend Megumi. She is standing in a walkway just past the gateway. 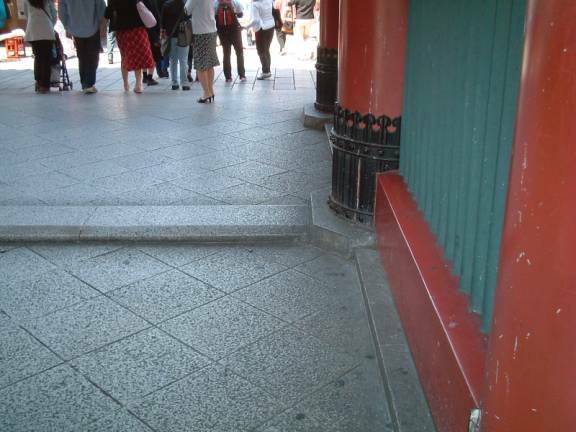 This walkway leads to a temple and is lined with semi-permanent street venders. There have been tons of people everywhere I have been in Japan, here was no exception (the crowd thinned out a bit for this picture so there were only a half ton of people in the foreground). 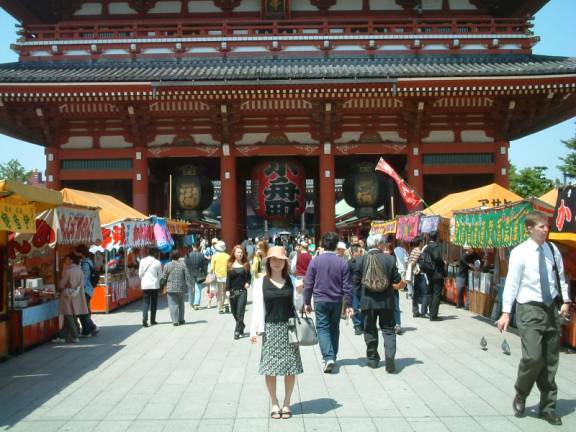 Here is Megumi again, in front of the Asakusa Temple at the end of the walkway. 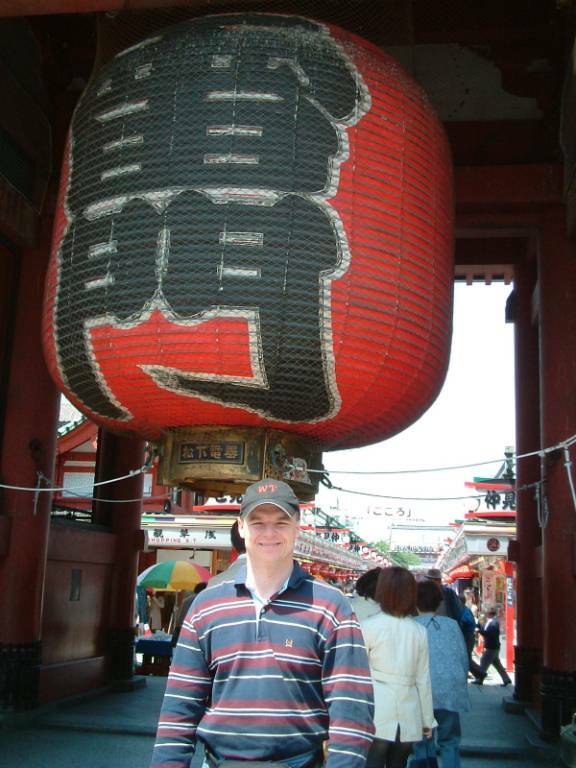 There is another big lantern, this time in the doorway of the temple. 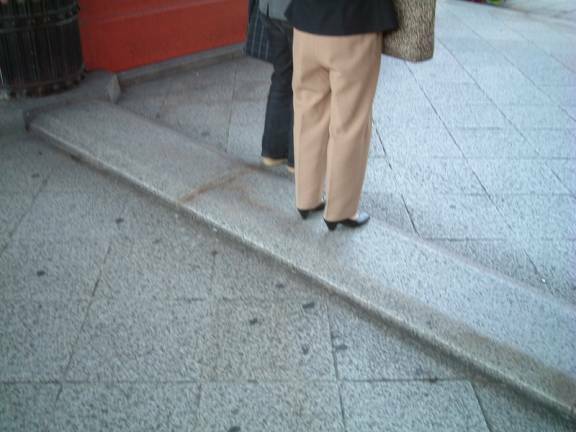 PS: the requisite raised ledge was also present in the doorway. This is a building to the left of the temple that fit my stereotype of old Japanese buildings. 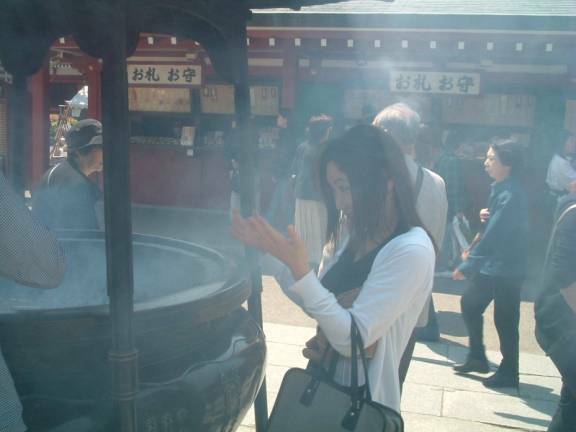 I am standing beside a gazebo that shelters a big pot with a lot of incense burning in it. The idea is that you bath yourself in the smoke for some reason. It kind of reminds me of getting smoked out due to a wind change at a camp fire. Megumi showing me how it is done. Hey it has the same effect as a camp fire back home. Megumi proceeded to cough and rub her eyes for about 3 or 4 minutes. I passed. She is not a real Mieko (apprentice geisha) or a Geisha. 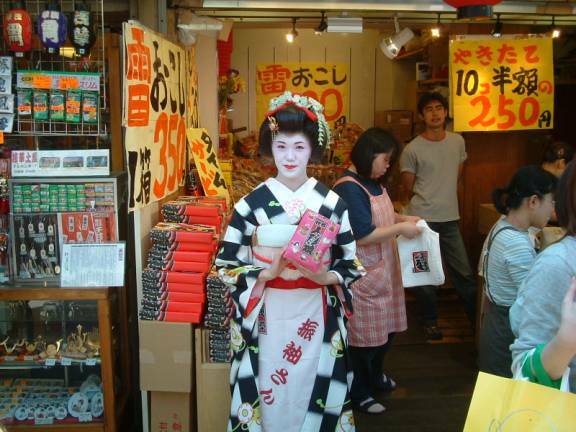 She is just advertising goods for sale to us tourists. Before women are married they wear Kimonos with large cuffs and sleeves, while the cuffs are much smaller on the Kimonos of married women. Kimonos cost anywhere from $1000 to $10000 (and more). Megumi has 3 Kimonos costing $2000, $4000 and $8000. Most young girls have one or two Kimonos while older women can have 10, 20 or more Kimonos. Many Kimonos were passed down from generation to generation however a lot of families had to sell their Kimonos after the war. Young men and women have a national coming of age ceremony the second or third Sunday in July. 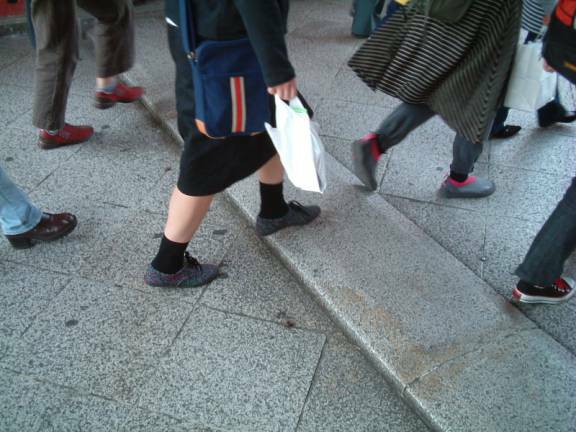 All 20 year olds gather in community centers around Japan to listen to a few speeches in their best clothing. After which they are adults. 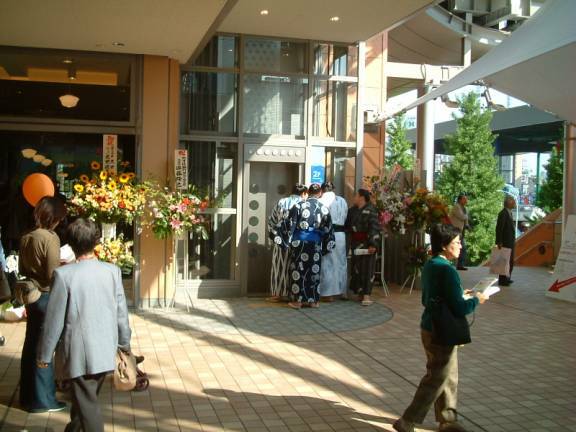 Grandparents spend serious money for Kimonos for this coming of age ceremony. Lately Kimonos are rented for this occasion at $1000 for the day. They are really serious about their group activities here in Japan. 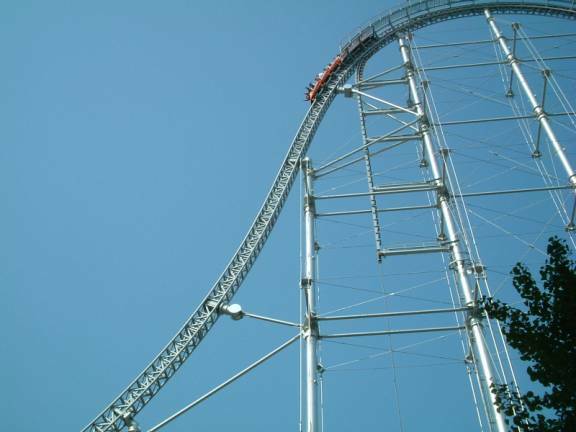 This is one mother of a big roller coaster in the middle of Tokyo, beside the Tokyo Dome (I estimated it to be about 14 stories high). There is no real delineation of realestate usage. I could not really tell the difference between residential and industrial areas in Tokyo. Many industrial buildings have apartments incorporated into them. After being here awhile I am starting to tell the difference a little bit. As soon as Megumi saw the coaster she said lets go, I said forget it (I hate heights). She would not go herself, so I felt a little bad, but just a little. Tokyo Dome holds major sporting events such as Baseball and Sumo Wrestling. 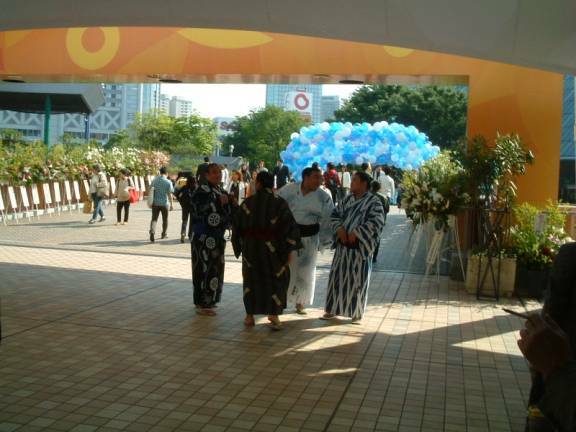 These 4 guys are Sumo Wrestlers taking in the sites during a tournament. A few moments later they walked over to a little elevator and all got on together (next picture). I decided to wait for the next elevator. Things a little to cozy in Japan at times. 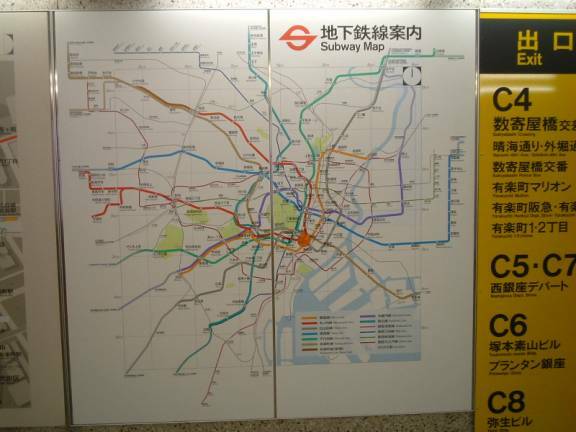 Above is a Tokyo City Subway Map. Contrast this with the Toronto City Subway Map. 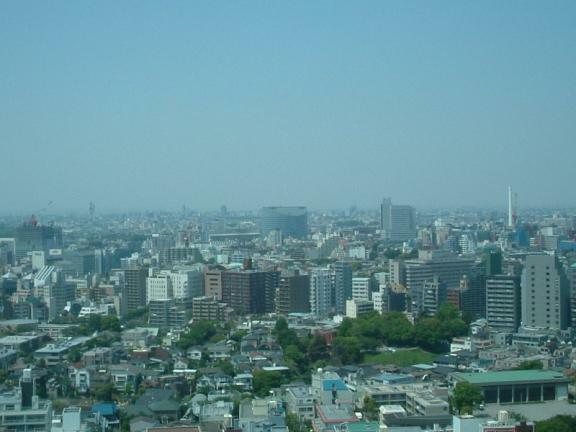 Tokyo is the largest city in the world in reguards to population with something like 30 million people in and around Tokyo. As far as land area goes I am not sure that Tokyo is anywhere near the size of Toronto (it is had for me to tell because everything is packed so tight here). Population density is the term that springs to mind when I think of Tokyo, I truly felt the meaning of the term here in Asia. 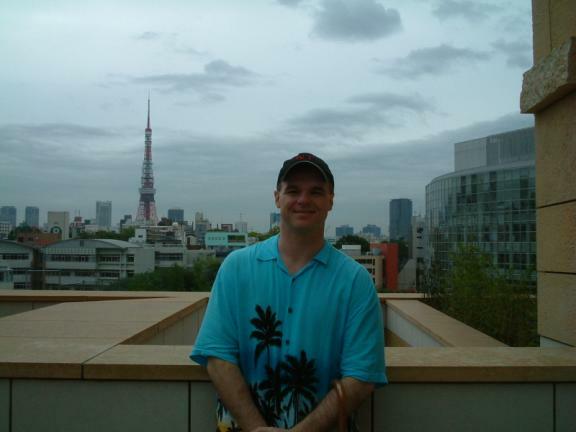 That is Tokyo tower over my left shoulder. 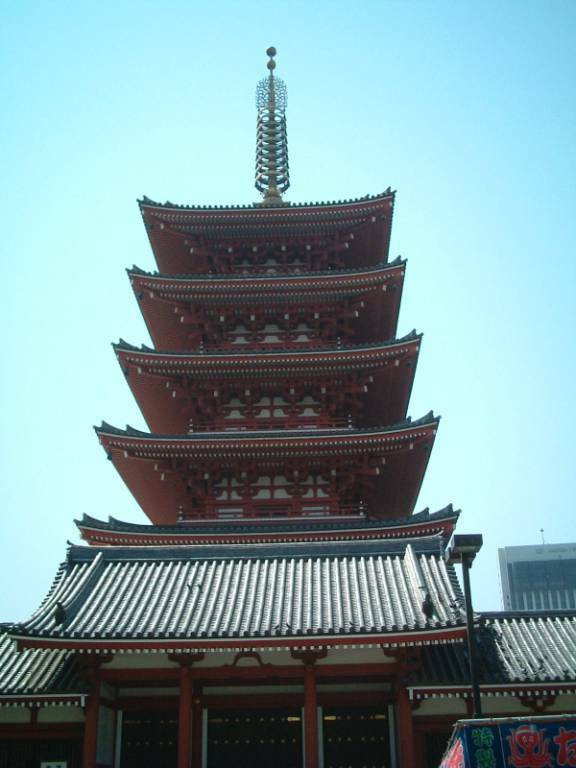 I could see this tower almost everywhere I went in Tokyo and it always seemed to be nearby. It looks a lot like the Eiffel Tower but if the Japanese are true to form it probably larger with state of the art improvements. It was very difficult to get a clear picture of these little sweethearts on their way home from school in Tokyo. They are elementary school students. 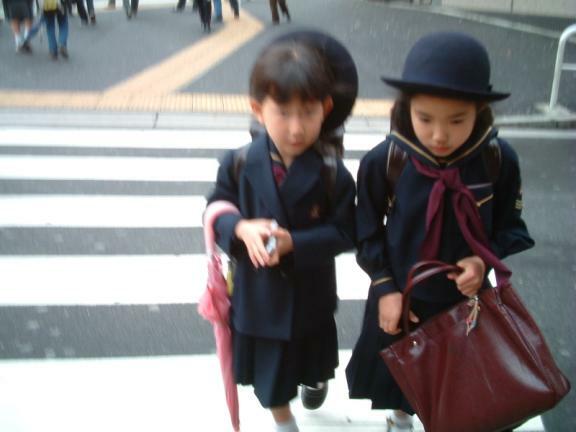 School uniforms are the rule here in Japan from grade one to high school. Conformity is very highly valued. It is worth noting that we saw at least 30 of these young children running home from school in downtown Tokyo unescorted. This is a very safe city. Metropolis from our hotel window. 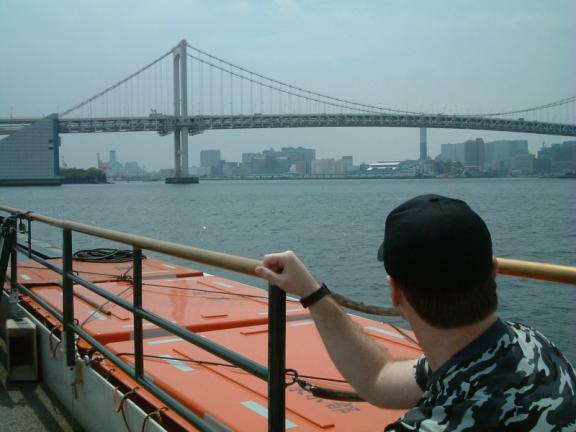 We are crossing Tokyo Harbour to Odiaba on a ferry. The rainbow bridge has one of Tokyo’s two monorails crossing it to Odiaba Island. Odiaba Island is man made and ultra modern. The streets in Odiaba were empty at 6pm on a weekday, something I have not seen in Asia and really eirie when you look back to downtown Tokyo and It’s 30 million people just 1 km away. We are just about to land in Odiaba. Since photography is a national obssession it was no problem finding someone to snap a picture or two for us (and they gave the camera back, no question about it). In the backgroung is Fuji National Television station with it’s distinctively futuristic ball type structure. In front of the television station is a big shopping mall and amusement park. This is the only area that is busy in Odiaba throughout the day. There is a scaled down version of The Statue of Liberty out of view to my right amongst the trees onshore. 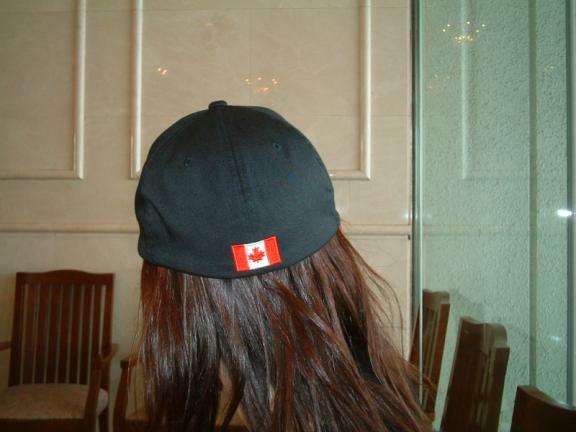 That is my hat before custom modifications. Megumi modeling my hat after customization. 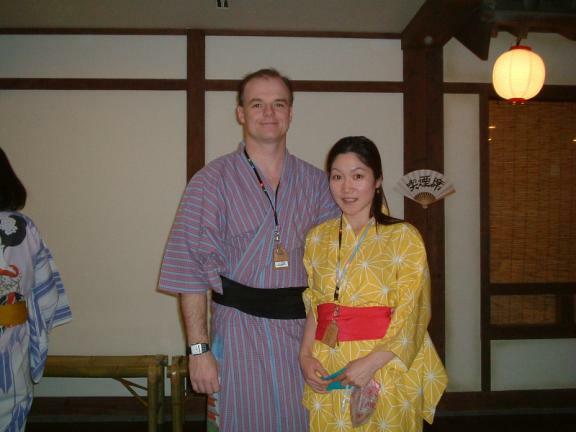 Megumi and I at an EDO period Onsen (Bath House). We are wearing Ukatas (feel a lot like bathrobes) which are worn as casual wear to summer fireworks and other festivals. They are like casual Kimonos. The bath house is a very popular institution in Korea but less so in modern Japan (Japan actually popularized bath houses in Korea during one of their periods of occupation of Korea). In Japan now there are not so many neighborhood bath houses as Korea but there are many Onsen resorts that people stay at for one or two days to get away and relax for a good soak. This Onsen is in Tokyo on Odiaba Island so it is not a resort. Megumi tells me it is one of the best bath houses or Onsens she has been to. To me it was just a big shower and bathing room with a lot of restaurants but she loved it. Be careful to check the style of room you rent at a hotel in Japan. The Tatami stye room is an empty room in which you role out thin mattresses on the floor to sleep at night and sometimes the room is communal.